Chopstick ribbons are another great way to adorn your personalized chopsticks, whether they are wedding chopsticks or gift chopsticks. 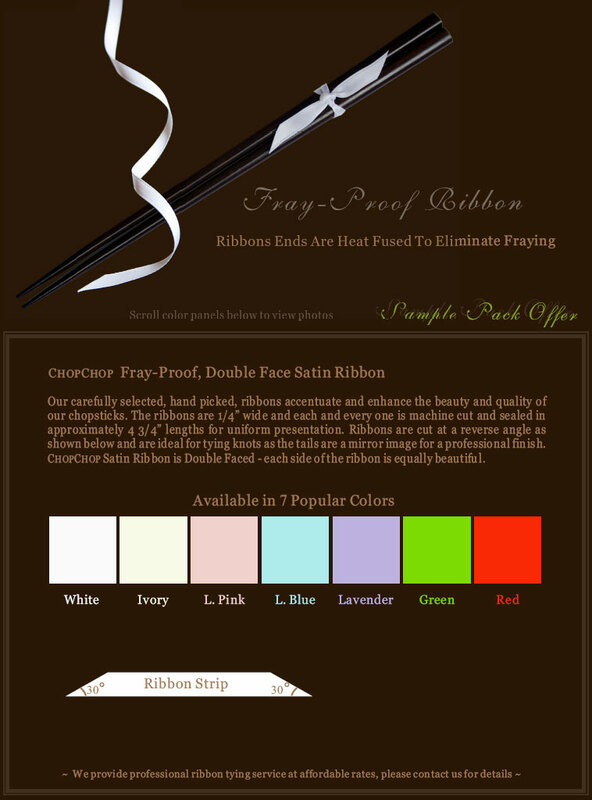 Bind your custom chopsticks together and add a splash of color with our fray-proof double-face satin chopstick ribbons. These ribbons come in seven different colors: white, ivory, light pink, light blue, lavender, green, and red. Simply hover over the colors above to see close up pictures of these richly colored, beautiful chopstick ribbons. If you're not sure which chopstick ribbons you'd like to order, you may want to check out our chopstick sample pack which includes seven pieces of ribbon.